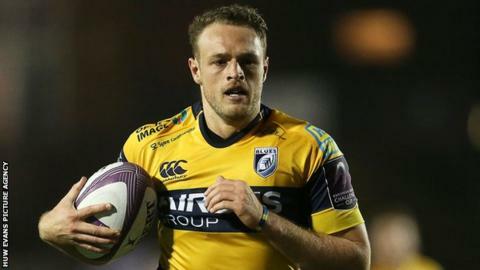 Wales and Cardiff Blues centre Cory Allen will miss the rest of the season after injuring an ankle against Leinster on Saturday. Allen, 23, went off on a stretcher during Blues' 14-13 Pro 12 defeat at the Arms Park with ligament damage. He said on social media: "And with that comes the end of my season! Gutted to have to go under the knife again." He had been released to the region from Wales Six Nations squad duty, having not played in the tournament. Allen suffered a hamstring tear after scoring a hat-trick in Wales' 2015 World Cup win over Uruguay, but returned at the end of December in the Pro12 derby win over Newport Gwent Dragons. He added: "Can only hope for an injury-free season next season." Blues have officially confirmed Allen's misfortune, saying he will undergo surgery in the week beginning Monday, 29 February. He was among four recognised centres in Wales' initial tournament squad, alongside Jonathan Davies (Clermont Auvergne), Tyler Morgan (Newport Gwent Dragons) and Jamie Roberts (Harlequins). Wales could opt to bring in back-up. If so, Gloucester's James Hook would be among the options for national coach Warren Gatland.